Now here's a game with a hint of originality. You can forget blasting aliens at speeds beyond the tolerance of the human trigger finger; you can forget warping through galaxies on dangerous space-warring missions; you can even forget trying to find your way through a D&D-like scenario with a batch of role-playing characters. In Bubble Ghost, there's this bubble—just a bubble. Actually, there's also this little guy called Bubble Ghost, and his mission—with your help via the mouse—is to guide the bubble through each of 35 different rooms. Bubble Ghost can go anywhere, touch anything, and is completely indestructible—but the bubble, just like all bubbles, has to be handled with the greatest of care. If it touches anything, it pops. Each time you lose a bubble, Bubble Ghost will punish you with an impatient glare. How, you may ask, can you move the bubble without touching it? You (or Bubble Ghost, if you want to get picky), must blow on the bubble, and it will then move in the direction you've sent it. Get the bubble to move across the room and to the exit and you've completed that screen and can move on to the next. I suppose I should mention (though you've undoubtedly figured it out already) that each room has a set of obstacles that you must get the bubble by. Not only do you have to keep the bubble away from the room's walls, but you must also keep it away from dozens of contraptions—candles, fans, needles, and even some electronic gadgetry—each obstacle designed to make your travel through the room fraught with danger. The first couple of rooms are easy, but the further you progress, the tougher things get. But don't fret. Once you play for a while, you'll learn a few secret tricks that'll help you on the way. (For instance, if you blow on a candle, it'll go out.) Learning these tricks will be a painless process. Because Bubble Ghost requires precision rather than speed, you won't tire your mouse hand out. In addition, the game's habit-forming nature will keep you playing for hours; you'll pick up most of the tricks just by experimentation. Bubble Ghost's manual is short and to the point, giving the player what he needs to know to play the game and nothing more. That's not a complaint, though. It's actually refreshing once in a while to pick up a game that can be played without reading a novel-length manual. The game's graphics are fine—the usual high-quality ST graphics we've become accustomed to seeing in game programs. If there's anything to complain about, it's the sound. I had to set my monitor to maximum volume in order to hear most of the sound effects. That in itself is not a major problem. Unfortunately, a few of the sound effects are significantly louder than the rest, which makes it difficult to get a good balance. But minor problems like low-volume sound effects don't affect this game's charm and originality. Bubble Ghost is clearly a winner. 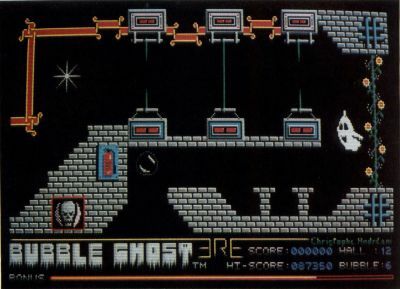 "Bubble Ghost's mission, with your help via the mouse, is to guide bubble through each of 35 different rooms."